ALL Masonry and Landscape is Proud to Serve Surebond as their Southern California Stocking Building Material Supply House. We are fully stocked with any product for any job large or small, and a Surebond certified applicator can be of assistance any time, to help you choose which product best suits your needs. SB-1300 Joint Stabilizing Sealer is a water-based, single component, epoxy-modified sealer and joint sand stabilizer. The product can be used both inside and outside, on old and new pavements, sealing paving stones and stabilizing joint sand at the same time. It is the ONLY sealer that can be applied immediately after paver installation, as it is breathable and will not trap the naturally occurring efflorescence. This breathability also decreases freeze-thaw damage and improves surface durability and ease of maintenance. SB-1300 Joint Stabilizing Sealer is solvent free and exceeds all VOC and EPA standards. SB-6400 Is a Wet Look Penetrating Sealer that will seal and enhance the beauty of new and old surfaces with a luxurious, wet look, matte finish that enriches surface tone and color contrast. It is breathable and will not trap efflorescence, allowing it to be applied immediately after new paving stones are installed. SB-6400 improves surface durability and freeze-thaw resistance while protecting the surface from salt, acid, and staining from oil, food, and other contaminants. SB-6400’s water repellent feature will produce beading of water on the surface and will help to inhibit biological growth such as mold, moss and algae. Ideal for horizontal and vertical surfaces including cultured and natural stone containing quartz or other silica’s. SB 6400 is also suitable for concrete and clay pavers, grout, unglazed tile and terra cotta. Not recommended for marble, limestone, agglomerate tiles and polished surfaces with a high gloss finish as they do not absorb the sealer. SB-8700 Wet Look Joint Stabilizing Sealer is an advanced premium acrylic sealer that will not yellow under exposure to sunlight. SB-8700 is a 2 in 1 product; it protects the substrate surface and stabilizes jointing sand at the same time. SB-8700 is specially formulated with antifungal agents designed to help inhibit the growth of mold, fungi and moss on horizontal pavement surfaces. It forms a tenacious bond to the concrete or masonry surface. The high solids formula combines properties of adhesion, flexibility and UV light resistance to provide a long lasting surface seal and sand joint. SB-8700 will penetrate the substrate and provide a protective layer on the surface that is resistant to mild acid, alkali, and salt attacks. SB-8700 will increase the stain resistance of the concrete and allow easier cleaning, maintenance, and extended wear. SB-8700 can be applied immediately after paver installation, as it is breathable and will not trap the naturally occurring efflorescence. SB-8700 is an advanced formula that makes it “rain safe” in 90 minutes. SB 6000 Is a Wet Look Sealer that seals and enhances the natural colors of treated surfaces leaving a wet look to the finished surface. It is breathable and will not trap efflorescence allowing it to be applied immediately after paving stones are installed. SB-6000 Wet Look Sealer improves surface durability and freeze-thaw resistance while protecting the surface from salt, acid and staining. Wet Look Sealer has the consistency of water and is milky white when applied and dries clear with a wet look on the surface of the pavement. SB-6000 Wet Look Sealer can be used both inside and outside on existing and new pavements. SB-7000 is a water-based, single component epoxy-modified Gloss Finish joint sand stabilizing sealer. It seals the surface and bonds joint sand between interlocking concrete, clay and natural stone pavers. It also seals and protects decorative, stamped and patterned concrete that has been colored with integrals, acid stains, release agents and color hardeners, as well as cast in place and pre-cast concrete. SB-7000 can be applied immediately after the installation of new pavers and will not trap moisture and efflorescence. SB-7000 exceeds all VOC and EPA standards. It is non-hazardous and has the consistency of water. It is milky white in appearance when applied, and dries crystal clear creating a semi-gloss finish. SB4000 is a water-based, Single Component, Reactive Siliconate sealer which can be used on old and new pavements, sealing paving stones, interlocking concrete, clay and natural stone pavers. This product also seals and protects decorative, stamped and patterned concrete that has been colored with integrals, acid stains, release agents and color hardeners, as well as cast in place and pre-cast concrete at the same time. SB 442 Is A concentrated non-acid Biodegradable degreaser and general purpose cleaner for use on pavers, concrete and retaining walls and can also be used on manufactured and natural stone, tile, terrazzo and stucco on both horizontal and vertical applications. This technologically advanced cleaner removes motor oil, food and beverage stains. It is environmentally friendly and replaces several types of harsh acid cleaners. SB-442 General Stain Remover’s unique Clean Rinse Technology lifting power allows residue to be quickly and easily rinsed away with a high or low pressure water sprayer. SB 488 Efflorescence & Rust Remover's unique "Clean Rinse Technology" lifting power allows deposits and residue to be quickly and easily rinsed away with a high or low pressure water sprayer. The product is suitable for both horizontal and vertical surfaces and is Low VOC, Biodegradable and Phosphate Free. For best results use at full strength (never dilute). SB-488 does not contain muriatic, nitric or hydrochloric acid. This Cleaner is formulated specifically for use on pavers, concrete and retaining walls it can also be used on manufactured and natural stone, tile, terrazzo and stucco on both horizontal and vertical applications. Not recommended for wood, rubber, plastic, metal tiles or similar metallic surfaces. The product quickly, safely and easily removes mineral deposits like efflorescence that form naturally within building materials and from external sources like rust and hard water. 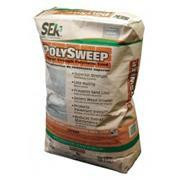 PolySweep is designed to keep sand in the joints by creating a semi-solid joint. PolySweep polymeric sand is a blend of native sands conforming to (ASTM C-144) and binders specially formulated to allow the joints to expand and contract with the elements such as extreme heat, extreme cold and freeze/thaw cycles. 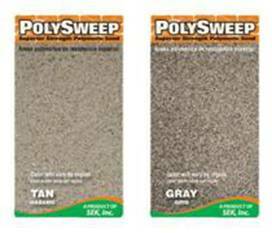 PolySweep prevents sand erosion from the pavement joints caused by rain and other water run-off. PolySweep has proven to produce less hazing, deters weed growth and reduces overall pavement maintenance. 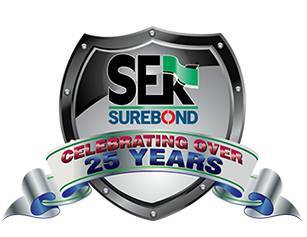 SEK-Surebond is defined by this core set of principles that haven’t changed for over 25 years. We, along with ALL Masonry and Landscape, look forward to working closely with you in the coming years to build hardscapes that will last, and look beautiful for a lifetime. Samples are available upon request.